Painting Date Night – At Home! I have recently gotten into watercolors! It’s something I’ve been thinking about for a while, so one day I bought a cheap Melissa & Doug watercolor paint set for kids & a pack of 15 pages of watercolor paper. It was like $11 total. I’ve seen so many blogs for ‘beginner’ watercolor painting that have a huge & expensive list of supplies. Seriously, the kids’ sets work just as well for learning, just get some watercolor paper & paint so you can see what it’s really about. So several weeks ago after buying my supplies, I…did nothing. I let them sit there for another week or two. I didn’t know where to start. Eventually I started looking up some ‘how to’ videos on YouTube. I decided we could host a private painting date, courtesy of YouTube. It was so easy to set up! My husband poured the wine while I set up the art supplies. We used our laptop to play this how-to video & painted along with the artist. Note: I’m not affiliated with that artist or channel in any way, I am just linking it to give you your own jumping off point for a painting date! The thing about watercolor is that you have to let the paint dryyyyyyy. I think that is why I haven’t ever attempted watercolor before. Motherhood is making me way more patient than I ever thought I was! But still, watching paint dry is as fun as it sounds. So what did we do between paint coats? We googled ‘married date night questions’ & had a good time sharing answers. It was such a fun night! My husband isn’t usually the ‘creative’ type, but he enjoyed it, too. We got to have a special date without leaving the house & without spending much money. We both liked the other person’s painting a little bit more than our own. Focusing on things eternal, together. This service was much needed in light of the recent news that hits home. I always say it’s the little things that make the biggest difference in marriage. Yesterday my husband & I celebrated 1,000 days of marriage. I got the idea to celebrate a while ago, when we celebrated 100 days of marriage. I set a reminder on my phone & just kept it in mind to do a little something special for my hubby on 9/15. Hurricane Irma hit Florida on 9/10. Thankfully, our home was spared from serious damage & our extended family is safe as well. Hundreds of trees were blown down. Several areas flooded. Many neighborhoods & traffic signals are still without power a week later. My parents stayed with us for 5 nights before their power was restored. It was scary during the storm & stressful after it. The situation helped me see exactly what my husband is made of. I got to see how much love he has for Jesus as he suggested we pray together over our house before the storm hit. I got to see him selflessly help friends, fellow church goers, & family members put up shutters. He was my rock & comforted me as I got more nervous about the forecast. He was a saint & gave our bed to my parents while they were here. He is the best father, provider, & friend I could have ever hoped to marry. So to celebrate our milestone, I used some of the cardstock from our wedding signs (yes, I still have tons) to make him this card (pictured with mason jars & cake topper from the wedding, too). I put a $10 (1,000₵) giftcard inside for us to use together. It was just a small token to show him how much I appreciate our marriage. I look forward to thousands more days with this amazing man! I have had this post in my draft box for over a year, but today’s prompt from The Daily Post finally made me finish it & hit publish! We don’t go as often as people from South Florida should, but nonetheless we love it. We’ve had many special memories at the beach. Going to Orange Beach, AL for Memorial Day has become a family tradition on my mother-in-law’s side & we look forward to it every year. Going with our friends is always a fun time – even more so now with their baby! 1 year dating anniversary beach weekend, October 2013. It’s where we got engaged May 8, 2014. It’s where we ended our 1 year wedding anniversary date. …and it teaches us important life lessons (like sunscreen EXPIRES). The beach is a place we feel comfortable. The smells, sights, & sounds are all very soothing. God really knows what he’s doing. At our wedding we did a sand ceremony. Half of the sand we used was from Ft. Lauderdale beach, taken from right where we got engaged. Maybe the beach holds a special place in our hearts because one of our first photos together was taken at the beach, at night, 8 or so years before we ever looked at each other as more than friends. I’m glad we live less than 30 minutes away from the beach. Here’s to many, many more beach days & nights with my wonderful husband! I firmly believe that in any relationship it’s the little things that make the biggest difference. Two years ago an amazing man took me out to a movie & then dinner on a Saturday night. Afterward, we went for a walk along Ft. Lauderdale beach. That’s where he asked me to marry him. Of course, I said yes. Why did we watch Mr. Peabody & Sherman? He says it’s because it was the only one available that ended at a reasonable time for us to get to our (surprise to me at the time) reservation. For our first real date back in 2012, he took me to Seasons 52. He took me back to that restaurant on March 8, 2014. After dinner on our first date back in 2012, we went out to Ft. Lauderdale beach for a night time stroll. We did the same on March 8, 2014. The movie was almost like a decoy. I enjoyed it! It was very cute & funny. We’ve been saying for the past 2 years that we should buy it & watch it again sometime. Just one of those little things to let him know that I love him. One Year Of Marriage Down, One Lifetime To Go! Grew more & more in love with God, & with each other! Time to eat that wedding cake! This past Lenten season was the most meaningful one to me yet. It probably has a lot to do with this being the first Lent as a married person. Being married has changed my perspective on a lot of things so far. It’s funny, during our honeymoon I kept telling my husband, “I don’t feel married; I don’t feel any different.” My married friends & family were telling me how different it is being married vs. engaged. I felt the difference from dating to engaged instantly. I remember thinking THIS IS IT; we were instantly much closer. So when it was day 3 of our honeymoon & I felt the same as I had the week before – over the moon happy & in love, but no different – I was wondering what everyone else was talking about. Then it started hitting me slowly. I started shifting focus from my husband being ‘the man who makes me happy’ to ‘my #1 priority on Earth.’ He’s my partner for life. That doesn’t just mean that he’s stuck with me for the rest of his life, it means he is my partner in this thing we call life. I always told him I wanted to ‘do life with him’ – not just be happy. There is a difference. I hope our life together is happy, but even when it’s not I want to go through it with him. So this Lenten season we just experienced was very special to me. When Ash Wednesday came, we had just gotten some sad family news. I wrote a post about making a pie for my husband that night to cheer him up. The service at our church was just what we needed. I really love our church & I am very grateful that I can make it to most of the non-Sunday events. It’s not a ‘feel-good’ church – I don’t leave services thinking everything is awesome & skip home. I am reminded that I am a sinner & Jesus died for me. There is one phrase from my Catholic days that goes around my head every now & then. I didn’t fully understand it back then, but rote memorization is good for some things. Lord, I am not worthy to receive you. But only say the word & I shall be healed. So between Ash Wednesday & Palm Sunday there were no ‘special’ church services or other events to keep us in line. We had to try & focus on God on our own. I gave up chocolate for Lent & my husband gave up road rage. Not that it’s a contest, but I think he ‘won’. I didn’t have a single piece of chocolate all through out lent – not even on Sundays which are supposed to be exempt from the self denial. But it wasn’t meaningful, like, at all. It wasn’t even that hard – and it didn’t make me any healthier because I certainly made up for it with non-chocolatey desserts (like the aforementioned pie). My husband, on the other hand, even though he didn’t maintain a perfect 40 days of calm in the car, probably benefited more by his actions, & so did I. Anytime a car cut us off & I saw him get tense I would tell him, “It’s still Lent.” That was more meaningful a reminder to me than skipping on a piece of chocolate. He was reminded to change his thoughts & actions against others because it was Lent, and he says he is trying to maintain that calm in general. I, on the other hand, had chocolate almost immediately on Easter Sunday without a second thought. 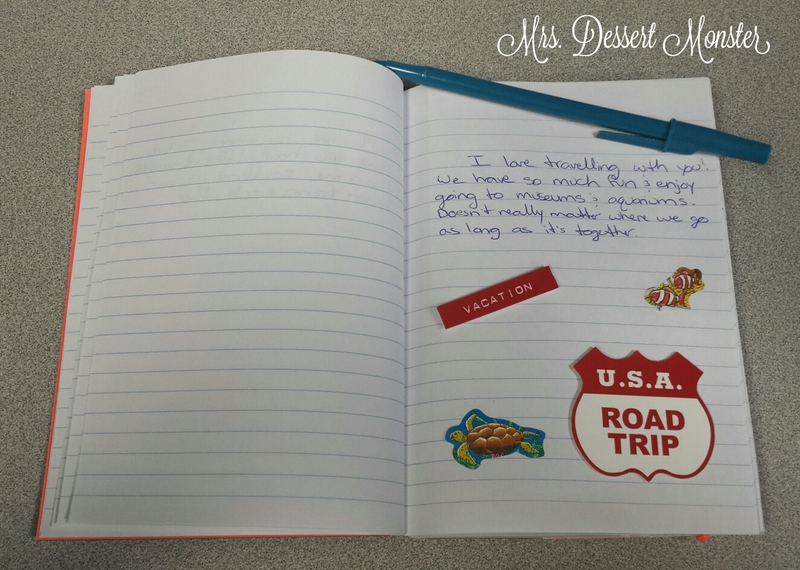 Having a partner in life keeps me focused; I’m accountable to someone. My husband cares about me & redirects me if I mess up. He celebrates with me when things are going well. I think he would say I do the same for him. On Palm Sunday, my friend Beth & I had the pleasure of playing hand bells to accompany the choir & children’s choir singing Hosanna. It was wonderful seeing the little kids come in with the palms. Our church does a really good job of getting the kids involved with worship. Our husbands cheered us on as we served the church in this way. I’m very happy we have married friends who love Jesus. Our single & non-Christian friends are awesome, too, but with another Christian couple we can vent & bounce ideas around that others may not understand or relate to. 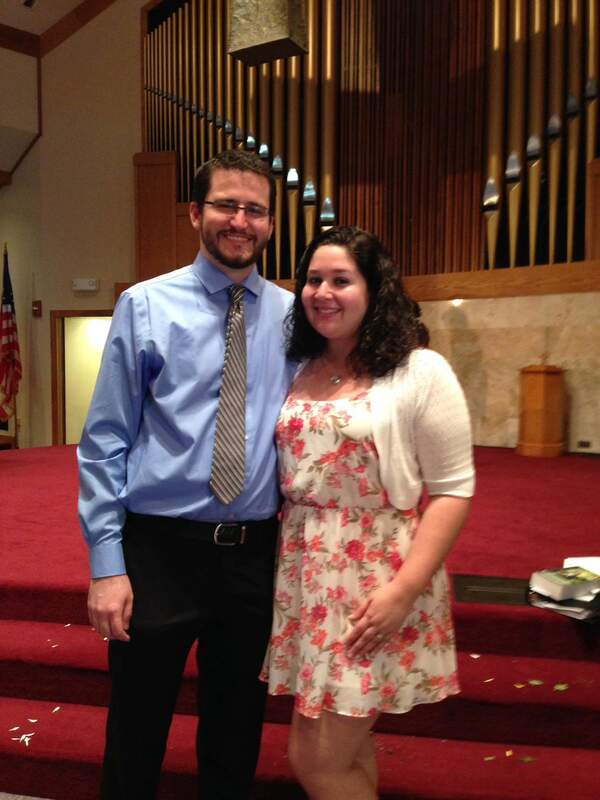 Beth & David have been married for over a year, & watching them together gives my husband & I things to look forward to! Holy Thursday service at the church was very moving. Our church did a service of the nails. Everyone got a nail when they walked in & held it throughout service. It was powerful. A meaningful moment for me was when I sneaked a peak at my husband while he was holding the nail & praying with his eyes closed. How lucky blessed am I? During the service, different words were nailed to a cross, representing sins. Photo credit to my Sunday school friend, Angela. For Good Friday, I stuck to the traditions of my Hispanic Catholic childhood & abstained from eating meat, & introduced the tradition to my husband. I actually really like that tradition because it is more cultural than spiritual. I like that even people who do not fully appreciate what Good Friday & Easter really mean are aware & paying homage to the sacrifice. Now that I am a ‘non denominational Christian who currectly goes to a Methodist church’ (thanks, Josh), I would call that prevenient grace. I also wanted to do a Messianic seder. Well, I got the idea while I was sitting at work on Good Friday (I meant to ask for the day off so that I could attend the Good Friday service at church, but alas, I did not.) 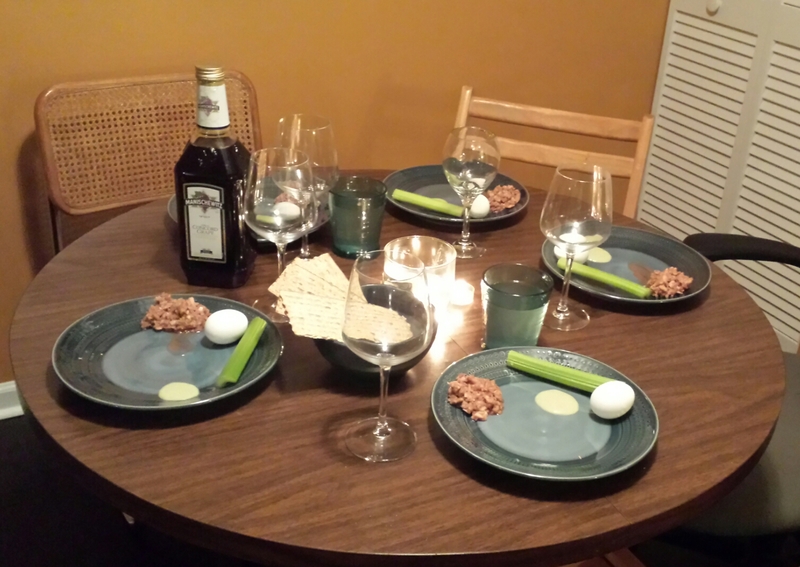 My friend Caroline did a seder in college & it was so great to celebrate Jesus’ last supper. I love the freedom we have as Christians to celebrate Old Testament rituals without being bound by the laws. Most Messianic seders take place on Holy Thursday, but this year, Passover & Good Friday coincided so I figured it was OK to do it then. We invited Beth & David over, & I drew up a little script & everything. We had a 5th table setting for Jesus. It was pretty informal, but very meaningful. We had seafood instead of lamb (see Good Friday above), so it was a blending of several traditions. The most important thing is that it was all for God’s glory. It was a lot of fun to have fellowship with our friends with traditions we don’t typically observe. I am so grateful to have a husband who enjoys praying & worshiping with others. Especially since this was an impromptu thing on my part, & he was totally down for it! Saturday, we took our niece to my coworker’s Easter egg hunt party. It was a lot of fun. We hadn’t spent the day with her in a while! Plus, everyone kept joking with us that it was good practice! I made a Bunny Cake & my 2 year old niece immediately said ‘my bunny cake’. How precious! At the end of the day we sent her back to my parents’ sound asleep, despite all the sugar! Easter Sunday was great. Since we were playing hand bells, we got to attend/perform at both the 1st service & the 3rd service (the two traditional services). Also, since Easter fell on the first Sunday of the month, we got to receive communion at both services! On top of performing with the hand bell choir, my husband also played trumpet in the brass quartet. I cannot reiterate it enough how happy & proud I am to have a husband that loves serving the Lord in that manner! When we met in high school marching band over ten years ago, I could have never imagined that he would be my husband & I would get to see him play at church. It’s so funny how God works in our lives! I love that quote. So far, marriage has made me much more aware of God’s presence. I am constantly reminded of God because my husband is made in God’s image. I know that everyone is, but for some reason it’s in my husband that I see this clearer than I ever have before. My marriage is not just a piece of paper, or betting my husband half my stuff that we’re staying together. My marriage is, indeed, something holy. Today is our 100th day as husband & wife! Somehow I got the idea that this should be celebrated & starting brain storming on exactly how I wanted to do this. 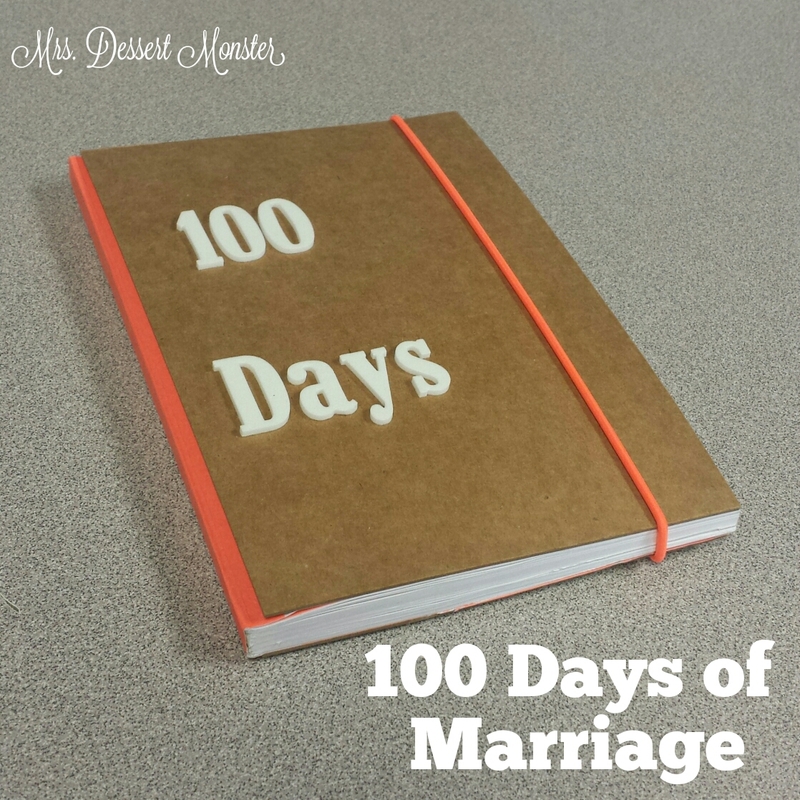 So I came up with the idea of writing 100 things I love about my husband & surprising him. I figured that if I couldn’t come up with 100 things I love about him, I was in trouble. I’m not saying I immediately sat down & scribbled 100 things off of the top of my head like it was easy. It took me weeks to fill up the 100 sheet notebook I bought. I actually learned a lot over the past couple of weeks. I started observing my husband so that I could adequately describe all of the little quirks and nuances I love about him. I know I love my husband entirely, but spelling out all of those little things wasn’t as obvious as I originally thought. 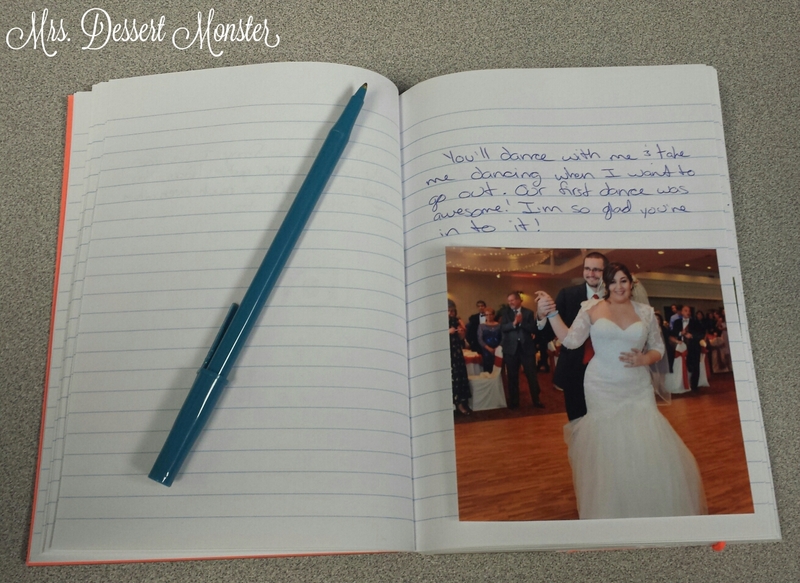 So I found myself studying him closely as I filled up this notebook, unbeknownst to him. I actually though of several more things I could have written once I was done, which is wonderful. Turns out I really do love him, like, A LOT. I almost spoiled the surprise about a week ago when he told me he had trumpet practice for Easter on the 30th & I reacted in a way that made him ask me if I had plans. I forgot that the plans were only in my head! I spent the next 5 minutes giggling & trying to get him to drop the subject. I wanted to surprise him and do something nice for him. I wanted to put in all this effort for him & show him how much he means to me without him doing anything in return. The best part about this notebook, though, is that if I ever doubt our marriage I can go back & read what I wrote in my own words about the man I married. If troubled times hit us & I waver, I will have a reminder of 100 reasons to hang on tight (there are many, many more than that).